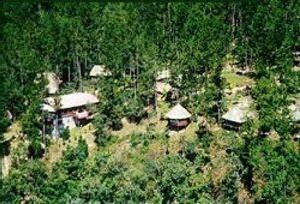 The Five Sisters Lodge & Tours is located in the scenic Mountain Pine Ridge Forest Reserve. This is the largest protected area in Belize, boasting an immense rainforest and natural wildlife sanctuary. The Five Sisters Lodge & Tours obtained its name from the five perfectly gushing waterfalls and the numerous crystal pools that form part of this natural wonder. These waterfalls empty into the famous Privassion River, which meanders through the heart of the forest reserve. The sparkling, clear water of the river, the shimmering spray of the falls and the contrasting green of the forest are accentuated by a wild display of colorful flowers of over four hundred and fifty species of orchids, palmettos and other exotic plants. The continuous flowering of these plants throughout the year produces nature's own kaleidoscope of brilliant colors and the crisp air is always heavy with a fragrant, exciting aroma. Carlos Popper, Belizean born, commenced his Five Sisters Lodge & Tours in 1991. His dream was to create an ecotourism facility that he could share with the rest of the world. Inspired by the natural beauty of his property, he set off to design his lodge with one clear objective: To provide sustainable architecture in harmony with the natural world that surrounds us. This he has accomplished with excellence.